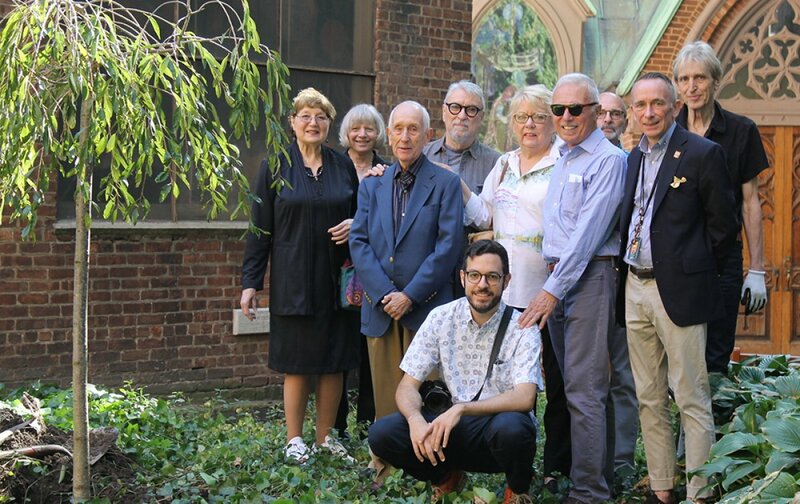 Yesterday, a weeping cherry tree was planted in Church of the Transfiguration’s garden and dedicated to the memory of my brother, Mark Joseph. While I awaited the tree to be blessed, I reached to touch a leaf. The soft green blade filled me with Mark’s presence. Beside me was a group of friends to share in Father John David’s blessing of the new addition to the church’s garden. 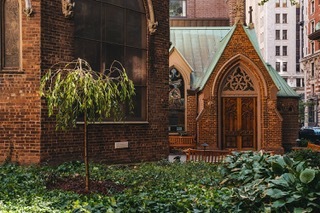 As we listened to Father’s prayer, a shaft of sunlight made its way through the surrounding buildings illuminating the young sapling. In the brilliance of God’s blessing for this autumn morning, I could see my brother’s smile. Mark was my youngest brother. Born with a learning disability, Mark met life struggles with remarkable courage even unto his death. Those who knew Mark fell under his spell. He was funny, sometimes cunning, always affectionate, and never forgot anything. He could be introverted, but he could also be the commander-in-chief of any gathering. His laughter was infectious. His love for others was sincere and true. It was rare for Mark not to say: “I’m happy!" 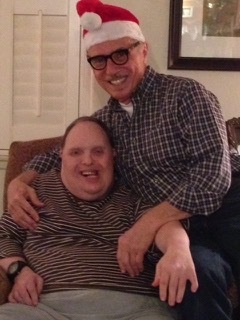 Mark and Ray celebrating Christmas. Mark knew every holiday, but Christmas was the one he waited for all year long. Many years long ago, our mother began the tradition that after Thanksgiving a small artificial Christmas tree would be set-up in Mark’s bedroom. Every Christmas that I was visiting my family I can remember passing by my brother’s bedroom (usually on purpose to tease him) and see him with wide eyes, head turned toward his tree and looking at every ornament as a king would look out at his kingdom. Of course, all of this was just a prelude to the big event, coming on Christmas morning. From a living room chair, Mark would eye all the wrapped packages looking for one in particular. That one gift that he knew would be there was in a small wrapped box. Gleefully smiling with much anticipation, the removed wrapping would reveal another treasured watch. For Mark, like the pot of gold at the end of a rainbow, a new watch was the big and best prize that he had waited for. “Oh boy!” he would say holding his new watch amidst discarded wrapping paper and ribbons. It was hard for Christmas lights and glass ornaments to compete with Mark’s brilliant and joyful expression. Our new happy weeping cherry tree.